The Historical Society of East Rockaway & Lynbrook and the Ancient Order Hibernians had the opportunity to commemorate the 176th anniversary of two horrendous shipwrecks – the December 1836 wreck of the Bristol and the Mexico which crashed off the Rockaway coast in January 1837. This ceremony commemorated the untimely deaths of over 140 persons primarily Irish immigrants who were seeking a better life. Art Mattson, author of Water and Ice, a book tracing the history of these events, recounted the story of both voyages. Joseph Beyrer, an esteemed bagpiper, capped off the event with a hollowing tribute. HSERL is proud to participate in this yearly tribute initiated a number of years ago by Eddie O’Reilly of East Rockaway. The Bristol Mexico obelisk is located in the Rockville Cemetery on the corner of Ocean Avenue and Merrick Road, Lynbrook/Rockville Centre. The obelisk dates to 1841. The story is a harrowing tale of bravery, cowardice, community concern and generosity in affording these poor souls a resting place of honor. Art Mattson, Lynbrook Village Historian, quoted Walt Whitman’s Leaves of Grass in which Whitman so profoundly describes the awful tragedy. We are proud that HSERL can bring to our communities such outstanding events. 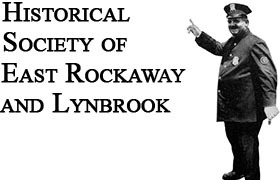 The Historical Society of East Rockaway & Lynbrook announces a new dimension to its presence in our communities. The Long Island Railroad Lynbrook station will now display memorabilia from East Rockaway & Lynbrook. The LIRR Branch Manager, Patrick Gerakaris has had installed two shadow boxes in the waiting room of the Lynbrook Station. HSERL will be able to display pictures, and other small artifacts in the station lobby. Madeline Pearson, HSERL Executive Director, and Arthur Mattson, HSERL Director and Lynbrook Village Historian, will begin the process of mounting pictures in the cases. It is a wonderful opportunity for us to share our story, with not only local commuters, but all people who use the Lynbrook station. In the process of exploring our local history, we came in touch with another aspect of our story. Who would that be? The Lynbrook PBA. They, too, will have an opportunity to share their history here with everyone.